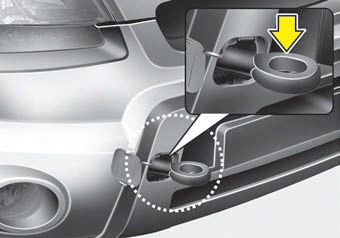 Towing in this manner may be done only on hard-surfaced roads for a short distance and at low speeds. Also, the wheels, axles, power train, steering and brakes must all be in good condition. 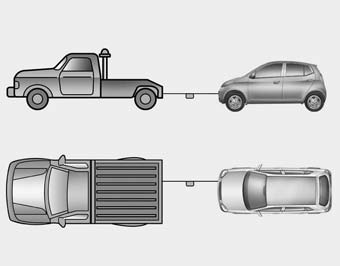 Only use a cable or chain specifically intended for use in towing vehicles. Securely fasten the cable or chain to the towing hook provided. Do not jerk the hook. Apply it steadily and with even force. Drive carefully so that the towing strap is not loose during towing. 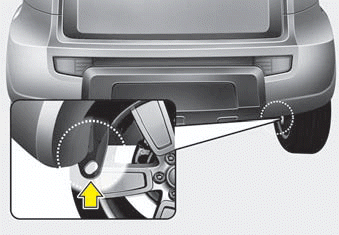 Press the brake pedal with more force than usual since you will have reduced brake performance. To avoid serious damage to the automatic transaxle, limit the vehicle speed to 15 km/h (10 mph) and drive less than 1.5 km (1 mile) when towing.